Job seekers, beware the telephone. For years, the phone interview was a preliminary step that allowed an employer to give a candidate the once-over and schedule an in-person interview. But these days, many recruiters are using the phone interview to pose the kinds of in-depth interview questions previously reserved for finalists. What's more, job hunters say the bar for getting to the next level has been raised much higher, catching many of them off-guard. In a recent first interview for a senior marketing job, Robyn Cobb was grilled by a hiring manager for an hour and a half on topics ranging from her work history and marketing philosophy to her knowledge of the company and its industry. "I thought it was never going to end," says the 45-year-old Ms. Cobb, who lives in Alpharetta, Georgia, and was laid off in December from a midsize communications firm. Until recently, skilled candidates could breeze through phone interviews in 10 minutes or less by answering a few softball questions. Little preparation was necessary, and most people could expect to be invited for a "real" interview before hanging up. These days, job hunters need to reserve an hour or more for a phone interview. They may be asked to discuss their full work history, including the exact dates of their job experience in various business areas. They may also be expected to cite examples and exact stats that illustrate their strengths and offer details on how they would handle the position. During a call earlier this year about a director of Internet marketing job, Jaclyn Agy of Wheat Ridge, Colorado, says she was asked to describe about 10 different marketing initiatives she's worked on, plus provide metrics resulting from each. "I didn't have those stats off the top of my head," she recalls of the hour-long conversation. "I expected to be asked that in a face-to-face." Ms. Agy, 30, says she assumed she'd need only to describe two or three past accomplishments in general terms. "I was taken back by how specific [the interviewer] was getting," she says. Ms. Agy was better prepared for a follow-up phone interview. She was later invited to meet with eight members of the hiring company in its Denver office, though she didn't land the position. Employers say they've raised the phone-interview stakes in part because they're attracting more candidates who meet their basic qualifications. They're digging deep to identify the best ones, and in some cases adding second-round rigor to phone screens as one way to accomplish that. "You can be pickier," says Joyce A. Foster, vice president of human resources at Hilex Poly Co. LLC in Hartsville, South Carolina. Salaried job openings at the company's 10 U.S. locations have been attracting up to three times as many qualified applicants -- including more candidates with experience in Hilex's niche, plastic film and bag manufacturing and recycling -- than during more robust economic times, she says. "Before, if a person had only recycling experience in paper, we might have said OK," Ms. Foster says. "Today we can be more specific. I'm going to find someone who's an even better fit." Recruiters are also seeking to weed out those who seem likely to change jobs as soon as the economy turns around. "We're trying to determine whether what we're offering truly meets a job seeker's long-term objectives," says Paul Newman, assistant vice president of human resources at OppenheimerFunds. And when it comes to candidates who have been laid off, recruiters for the New York-based asset-management firm want to know the circumstances behind what happened. "Was this person a high-performance, talented individual who was let go because of the economics of the business," he says, "or an average employee let go in the first round" of layoffs? For many firms, evaluating candidates over the phone also serves as a way to save on recruiting costs. "In this economy, you can't afford to fly every person out for an interview," says Jeff Cousens, vice president of organizational development at Patrick Energy Services Inc. in Lisle, Illinois. After joining the energy concern in January, he instructed recruiters to complete up to four comprehensive phone interviews with candidates before inviting finalists in. Previously, they made just one brief call, mainly to schedule in-person interviews. "When a candidate comes in to meet the hiring manager, recruiters have already gone through every detail to make sure they're a fit," says Mr. Cousens. 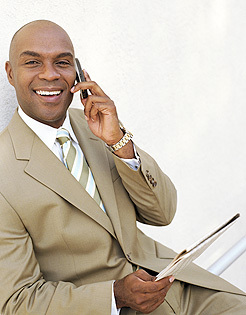 Job seekers should prepare for a phone interview as seriously as they do for an in-person one. When asked about your qualifications, for example, you can craft a better answer by asking what the company wants and why, says J.T. O'Donnell, a career strategist in North Hampton, N.H. If you're asked how many years of experience you have with a program you have used extensively, but not for years, you could reply by asking how much is required and at what level, says Ms. O'Donnell. Maybe the company chose a number based on how much experience the last person in the position had, and you might have just as much, but in a condensed time frame. You can then provide a convincing reason as to why you should be considered for the job even if your answer doesn't match exactly what the recruiter is looking for. How do you see yourself fitting in? "What traps a lot of people is they think and talk at the same time. They make up answers on the fly," says Mr. McGowan. "It's better if you know your conversational path." Don't expect to defer answering questions to your first meeting with a hiring manager, says Maureen Crawford Hentz, a talent-acquisition manager at Danvers, Massachusetts-based lighting manufacturer Osram Sylvania Inc. That may have been the case in the past, but not now. "People think if you're talking to someone in HR, this isn't a real interview," she says. But these days, it might be your only shot. Be sure to brush up on your phone etiquette, too. Ms. Crawford Hentz says candidates have put her on hold while they answered another call or tended to their children. Once she could tell a candidate was visiting a drive-through restaurant during a call because she heard a loudspeaker requesting the person's lunch order. Finally, be mindful of common faux pas, such as giving long-winded answers that go off topic. "Sometimes the longer you talk, the more it sounds like you're trying to explain your way through something," says Mr. McGowan. "The most confident people don't need to drone on." Another common flub: answering recruiters' questions before they've finished speaking. Not only does that show disrespect, but it "makes it seem like you have stocked, canned answers," he says. Sarah E. Needleman. This article is reprinted by permission from www.WSJ.com, © Dow Jones & Co. Inc. All rights reserved.